Transgender people in Manipur have started getting their due, including separate toilets. The government has begun recognising the community and responding to its sensitivities. 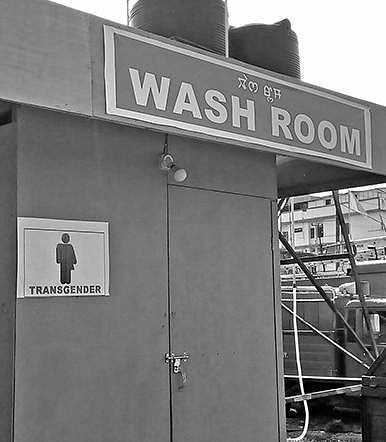 IMPHAL: Transgender community in Manipur have started getting their due, including separate toilets. The government has begun recognising the community and responding to its sensitivities. This is evident in the ongoing 10-day Sangai festival, which kickstarted on Tuesday. The organisers of the festival have installed two toilets for transgenders at its two venues in Imphal and Lambuikhongnangkhong. The toilets have been erected alongside those for men and women, ruling out discrimination. All Manipur Nupi Maanbi Association (AMNMA), an organisation of transgender people, is elated. “This is a progressive step taken by the government. Giving a separate toilet to the community in such a big festival is heartening,” said AMNMA chief and transgender activist Santa Khurai. “It gives an enabling environment to the community in terms of access to sanitation. We know that this is just the beginning, yet we appreciate the installation of separate toilets for transmen and transwomen,” she added. Manipur tourism commissioner PK Singh said it was one way of showing that the government cared for the transgender community.“Recently, some transgender people came to me to discuss another issue. I thought since they too come for the festival, installation of toilets for them is a genuine thing to do. Many of them are make-up artists and very much part of the festival. They didn’t have a place to relieve themselves,” Singh said. According to the 2011 census, Manipur has 1,343 transwomen. There has not been a survey of transmen. Khurai said rough estimates put the population of transgenders in Manipur at a few thousands. “Transgender people in the state often face discrimination. They are often harassed and sexually abused in concerts held in the open. So we have started working with the media to assert our identities and rights,” said Khurai.